Scott Winland of Blackout Booking and The Union and Kelly Lawrence of ARTS/West are doing what they can to make Athens an “arts destination.” The duo are two of the people behind the first ever Athens Community Art and Music Festival, which is slated to take place in uptown Athens August 17-18. For over 20 years Winland organized the Athens Community Music, a night of benefit music performed at various venues throughout Athens, gathering funds for local arts non-profits. 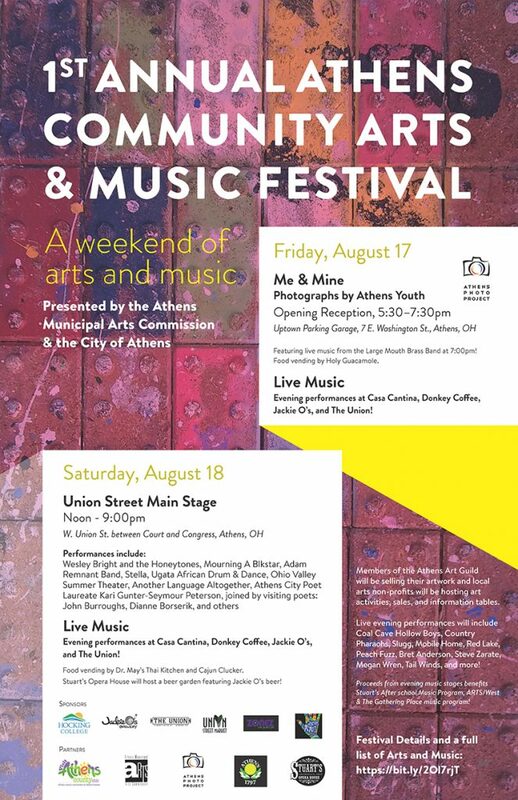 The Athens Community Art and Music Festival takes the art-centric base of the Athens Community Music Festival and incorporates into it elements of visual art, theatrical art, and more. The proceeds from all of the musical performances throughout the festival will go towards Stuart’s Opera House’s After School Music Program, ARTS/West, and The Gathering Place’s music program. On Saturday night, Stuart’s Opera House will also be hating an outdoor beer garden featuring Jackie O’s brews, the proceeds of which will benefit their after school music program. Listen to WOUB’s Emily Votaw’s interview with event coordinators Scott Winland and Kelly Lawrence above. Check out the full schedule of events below. Athens Photographic Project presents an opening reception at the Athens parking garage for the Wheatpaste exhibition of art by Athens County youth. Light refreshments and Holy Guacamole food cart. Large Mouth Brass Band performs at 7 p.m.
Music moves indoors to three different stages: Casa Cantina, Donkey Coffee and The Union featuring sets by The County Pharaohs, Acrylic Grooves, Slugg, Tailwinds, Red Lake, Caution Step, and more! 12- 9 p.m. – Outside on Union Street between Congress and Court Streets there will be the main festival with visual artists from the Athens Art Guild and Paper Circle selling their artwork and arts non-profits offering information on their organizations and arts activities. Dr. May’s Thai Kitchen and Cajun Clucker will be on hand selling their food and Stuart’s Opera House will be selling Jackie O’s beer to raise funds for their After School Music program. MAIN STAGE on Union Street from 12 p.m. to 3 p.m.
A variety of local and visiting artist performances featuring OVST, Ugata West African drum and dance, Athens Poet Laureate Kari Gunter-Seymour Peterson introducing two visiting poets, and more. The main stage shifts its focus to music featuring headliners Wesley Bright and The Honeytones, along with the Adam Remnant band, Stella, Hellnaw, Mourning A Blkstar and Mobile Home. The music moves indoors to three separate stages at The Union, Jackie O’s and Casa Cantina featuring sets by Coal Cave Hollow Boys, Slag Pile, Bret Anderson, Weird Science, Slackluster, Peach Fuzz, Colleen Carow, and lots more! Check out a Spotify playlist with some of the artists performing at the first ever Athens Community Arts and Music Festival below.